Connections with Brighton and Hove : A humble clergyman was responsible for three of the best known public schools in Sussex. The Rev Nathaniel Woodard was shocked at the standards of education when he became a curate at St Mary de Haura church in Shoreham and was determined to do something about it. 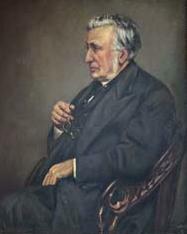 In 1848 he started a school in Shoreham and this expanded over the years to become Lancing College. The current buildings include the famous chapel designed in such a grand manner that it took more than a century to complete. He resigned his curacy in 1850 to concentrate on educational projects including the foundation of Ardingly and Hurstpierpoint Colleges. But in 1870 he was made a Canon of Manchester Cathedral by Gladstone and put most of the large stipend towards the schools. He insisted that all the schools he funded should provide an education soundly grounded in the Christian faith. When Woodard died aged 80 in 1891 he was buried at Lancing College. There is a plaque to him in Shoreham near the church. The Woodard Foundation, which now runs 46 schools, celebrated the 200th anniversary of his birth with a service at Westminster Abbey in 2011. 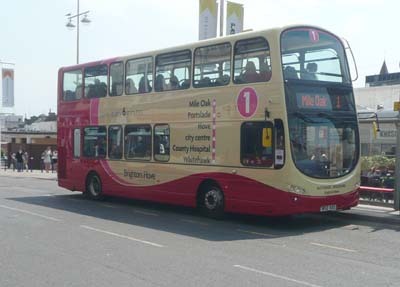 439 Volvo Gemini - carried name since delivery March 2012 on Route 1. 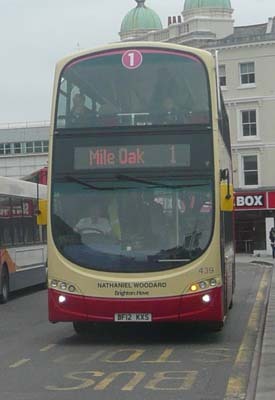 Name removed in July 2015 as bus repainted.